Browsing articles in "3D Printing"
‘Iron Man’ actor Robert Downey Jr. has teamed up with Limbitless Solutions to deliver an amazing new 3D-printed bionic arm to Alex Pring, a seven year old boy who was born with a partially developed right arm. In the video below you can watch as Alex is taken to a hotel room in Atlanta where he is greeted by none other than Tony Stark (Downey Jr.), with a very special gift for him. Downey then presents Alex with a new 3D-printed bionic arm modelled after the armour in the Iron Man movies. The two sit down together to compare tech, with Downey staying in character and discussing all the design troubles he has with his Iron Man armour, quipping that “yours might be better than mine” as the two share a robo-fist bump. The arm was developed by Limbitless Solutions, a volunteer group which work to build and donate low cost 3D-printed bionic limbs for children. Ordinarily prosthetic limbs like this cost upwards of $40,000 and are not covered by most health insurance policies, as due to the speed at which children grow the arm frequently needs replaced with a larger model. Using 3D-printers has cut the cost to around $300 an arm, a massive cost reduction which finally makes these much needed prosthetics readily available. Exciting as it is to have a Hollywood superstar show up, what is even more exciting is the potential that this technology has to revolutionise the way prosthetic limbs are made. Making the process faster, more efficient and extremely cost effective will change the lives of thousands of people all around the world. Developing an implant to help the heart heal itself. Medtech start up accelerates development of a circulatory support pump, designed to let the heart rest and heal without surgery, with the help of Rapid Prototyping technology. Within the US alone some 2 million people affected by heart failure are too sick for medication leaving doctors with no option but to resort to surgical LVAD ( Left Ventricular Assist Device) or a heart transplant. Both options are considered a last resort due to high risk and cost factors but now a Houston based medtech start up Procyrion may have unlocked an alternative in the form of a minimally invasive, catheter-deployed device designed to offer long-term treatment by providing the opportunity for the heart to rest and heal. Using fluid entrainment to augment native blood flow the Aortix device facilitates an acceleration of fluid, a net increase in cardiac output, reducing work of the heart through after load reduction. It is expected that the Aortix device may not just offer a treatment but also act as a preventative measure, treating younger, healthier patients before years of progressive damage occurs. By using Rapid Prototyping technologies, namely SLA (Stereolithography) the team has seen a reduction in lead times from 8-12 weeks to less than a week and lowered costs from $1500 to $5 when compared to producing the blood pump impeller in PEEK. US President Obama has proven a strong supporter of 3D Printing technology, not only through vocal acknowledgement of this technologies potential for enhancing innovation and economic development but also through the creation of 3D Printing hubs within the US. 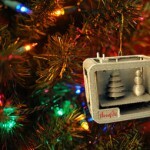 Now the Obama administration is set to include 3D Printing into the long-held tradition of decorating the White House for Christmas, with the first ever 3D Printed White House Ornament Challenge. 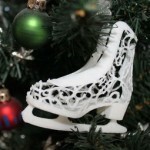 The competition which ran from the 30th of October to the 10th of November was the result of a collaboration between the White House, the Smithsonian Museum and 3D Printing website Instructables. 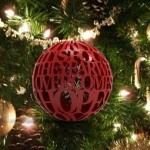 Entrants were simply required to create a decoration (no larger than 3″ x 3″) which reflects the magic & wonder of the holiday. Some 300+ designs were submitted with entries narrowed down to 20 finalists based highest number of votes from instructable members. A panel of judges (comprised of staff and respected members of the instructables community) are now set to rate the finalists with the averages of ratings set to determine the winners. 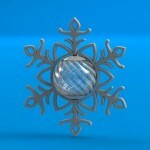 Winners of this festive challenge will not only have their designs 3D printed but also shipped to the White House where they will be hung in the East Wing of the White House during the holiday season. 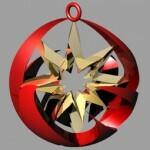 In addition the winning designs will be featured on the Smithsonian 3D data platform and will join a small collection of White House ornaments in the political history division of the Smithsonian’s National Museum of American History. 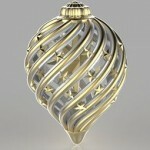 Interested in creating a truly unique Christmas decoration contact LPE today with STL files for quote! Comments Off on Growing the next generation of creators! Growing the next generation of creators! While lowering costs and growing material range has allowed 3D Printing to grow in popularity over the past few years, the future of the industry may lie in the hands of our schoolchildren as the industry and government alike seek create a generation of creators. Last October the UK Department of Education revealed a pilot project which would allow 21 state secondary schools to use 3D Printers across the curriculum with the aim to encourage students to embrace the design process and better equip them with the engineering an design skills required by employers. Following the overall success of the pilot and a significant overhaul of the UK education system it appears that the UK Government is committed to developing the creative skills of the future UK workforce with children as young as five learning key design skills while secondary school students will learn how to use 3D Printers as part of the Design & Technology curriculum. With further changes to the educational system to include electronic design and computer coding it is likely that we will see these very students tweaking existing 3D Printers to create more user friendly models as they become more accustomed to both design and 3D Printing technology. In addition to the UK Governments focus on developing the creative minds of the future the 3D Printing industry itself is seeking to facilitate the further expansion of this growing pool of young creators. 3D Printer manufacturers such as Builder, specifically targeting the education system with their 3D Printer range, while the leading 3D Printing Event in the UK and Ireland, TCT Show + Personalize has placed education at the heart of their exhibition for the second year running with the hugely successful programme TCT Bright Minds UK. This years programme which is sponsored by industry leaders such as 3D Systems and Black County Atelier (BCA), will see over 500 schoolchildren gain real hands on experience with design tools and 3D Printing technologies through free two hour workshops. TCT Show + Personalize, takes place at the NEC Birmingham from the 30th of September to the 2nd of October, not just for schoolchildren this industry leading event will provide access to a wide range of 3D Printing Manufacturers and Rapid Prototyping Service bureaus with a range of keynote sessions aimed at helping companies and individuals get the most out of product development technologies. Register now for your free visitor pass. 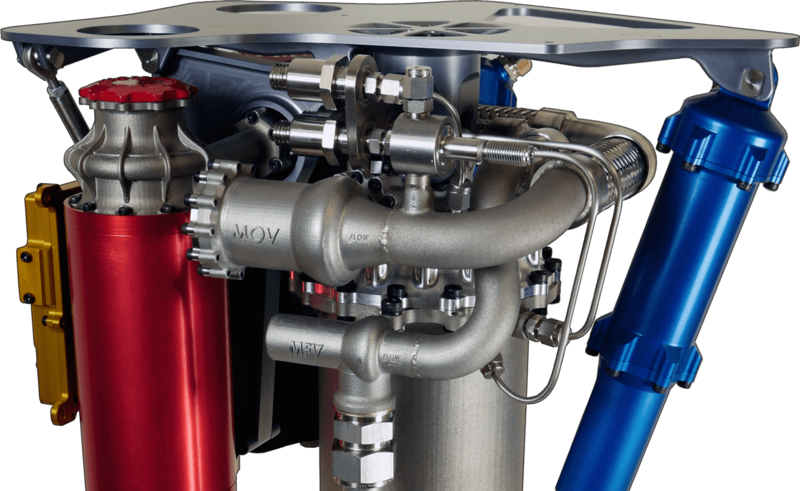 Interested in finding out more about Rapid Prototyping & Additive Manufacturing services? 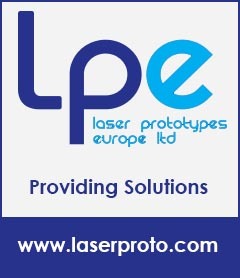 Visit the longest established Rapid Prototyping and Additive Manufacturing service bureau, LPE at stand H14. 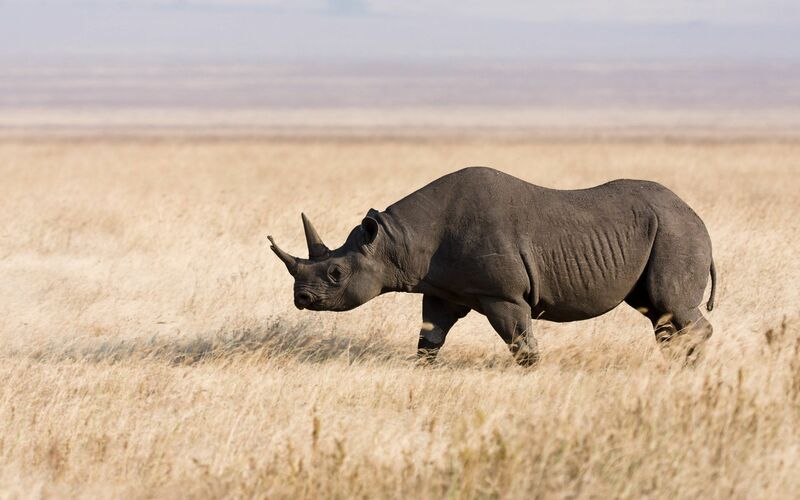 With surgeons in China confirming the successful implantation of a 3D Printed vertebrae into a 12 year old bone cancer patient, it is little wonder that Cambridge based market research company IDTechEx project a 365% growth in Medical 3D Printing by 2025. Earlier this month doctors at the Peking University Third Hospital successfully completed a first of its kind surgery, when they implanted custom made 3D printed vertebra into a 12 year old bone cancer patient, Minghao. The five hour surgery saw the removal of a tumour located in the second vertebra of the boys neck and its replacement with a 3D-printed implant, with Dr. Glenn Green, who co-designed the implant stating “it has worked just the way we hoped” with Minghao expected to make a strong recovery. 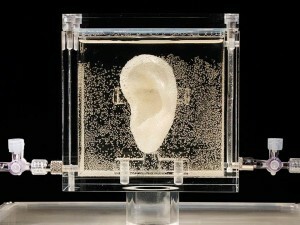 3D Printing facilitates more natural implant integration. Prior to the surgery Minghao had been lying in the orthopaedics ward of the hospital for more than two months, with the tumours growth preventing him from standing for more than a few minutes at a time. In the past the vertebra would have been replaced by a standardised, hollow titanium tube requiring screws or cement to hold it in place. In addition the patient head would need to be frame by pins after surgery for a minimum of three months to prevent damage to the implant. 3D Printed vertebra is much stronger and more convenient than traditional methods. Deigned based on the patients actual vertebra, tiny holes were made in the implant to allow surrounding bones to grow into the print and secure it in place. The new vertebra spans the entire width of his spine. as opposed to thinner traditional tube, and allows room for nerves to be threaded through while carrying enough strength to support the bone that sits on top of it. 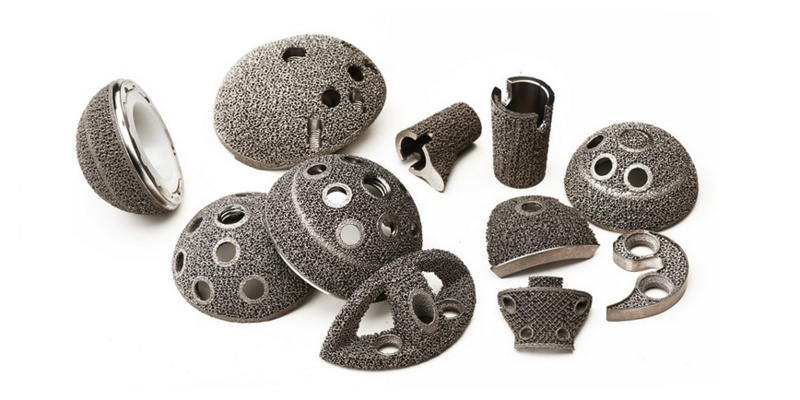 Using 3D Printed technology doctors anticipate a shorter and less inconvenient recovery time that that experienced with traditional implants. Last months post included details on the exoskeleton part developed with 3D printed technology, which enabled a young paraplegic take the ceremonial first kick at the World Cup 2014 opening ceremony, which got us thinking about role of 3D Printing in the development of new wearable technologies with some interesting applications (or at least we thought so..) included below. 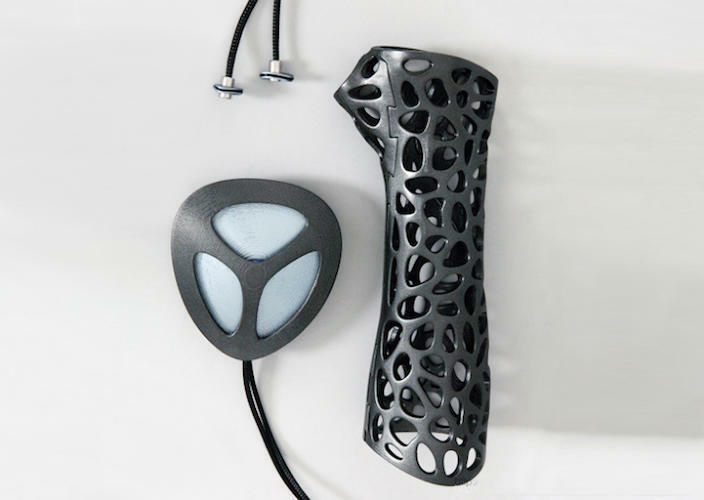 Winner of the A’Design Award in the 3D Printed Forms and Products Design category, the Osteoid Medical cast claims super human heal times (38% faster) for broken bones. 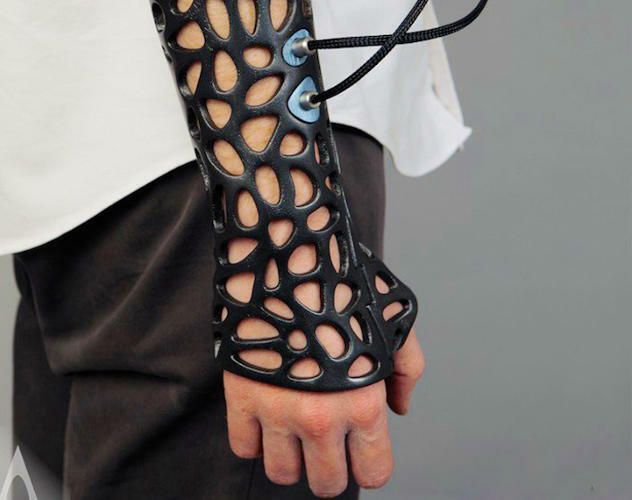 Designed by Turkish industrial designer Deniz Karasahin, the Osteoid cast, a black lightweight 3D Printed cast featuring latticework design uses an ultrasound device to speed up the healing process. In addition to offering improved heal times the cast is filled with ventilations holes, freeing wearers from the dreaded itchiness, bulk and smell associated with traditional plaster casts. Still in the concept stages, future adaptation of the cast, could offer patients a more fashion conscious alternative. While the cast itself may look more fashion accessory than medical cast research published in the Journal of Bone and Join Surgery supports the benefits of low intensity pulsed ultrasound for healing bone injury. Speaking on the future viability of the Osteoid Cast, world renowned hand surgeon Dr. Michael Hausman suggested wide scale implementation in medicine will be dependent on production costs, as 3D Printing technology would be more expensive than traditional plaster and splint casts. 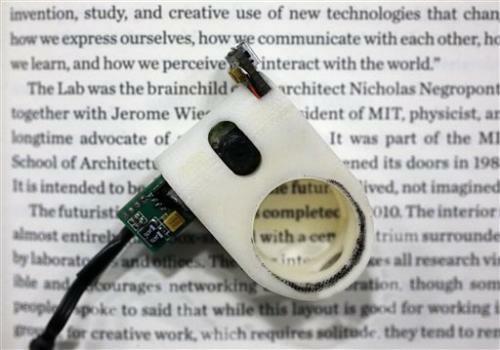 Following three years of research a team at MIT have developed a reading device that can be worn on the index finger. The device know as FingerReader features a mounted camera capable of translating either single lines or complete blocks of text into an audio voice in real time. The device while not yet compatible with touch screen devices can translate text across a wide range of media such as books, computers and newspapers, with haptic feedback provided to indicate that the user should move their device to continue reading or to indicate the end of a page. With some 11.2 million people in the US alone suffering sight problems, the FingerReader is likely to have much wider implications than simply reading a restaurant menu, the device could potentially see visually impaired re-entering the working environment. Thumbs up for BMW Workers. Using 3D Printing techniques as part of its product design and development process for the past 25 years BMW have now turned to 3D Printing to physically augment its car-plant workers, giving them stronger, augmented thumbs. The move aims at reducing strain related injuries and improving efficiencies. A portable 3D camera is used to capture the unique size and shape of each line workers thumb, with the scan then used to build a thumb guard made of a semi-flexible plastic hybrid material on a Selective Laser Sintering machine. With each structure perfectly fitted to the wearer’s thumb the thumb guard flexes in a closed position and locks into place when the digit is raised in a thumbs up position. When trialed in the companies Munich vehicle assembly plant very positive feedback was received from BMW workers, with the splint effectively resisting strain and spreading the load associated with pushing something like a stiff rubber plug into holes in the car chassis – something that was causing paint to production-line workers-. Roll out of this and other schemes to use custom 3D printed apparel to help production and prevent pain and injury are expected within BMW.